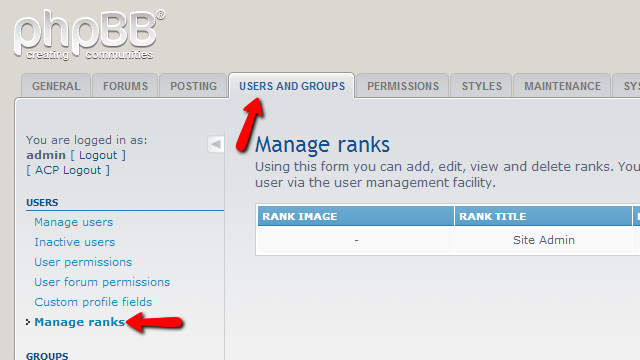 Ranks in phpBB allows you to have your users ranked by the number of posts they have been writing on your Board. You will be easily able to specify the criteria via the “Manage Ranks” feature of your Board and in this tutorial we will shows you how you should configure that in few easy to follow steps. In order to access the Manage Ranks feature you will need to login into the Administration Control Panel of your Board and then navigate to Users and Groups>Manage Ranks. The Manage Ranks page is quite a simple page, providing you with some additional information on the ranks feature and also a table view with all of the currently existing ranks on your forum. In order to add a new rank you should use the button located bellow a table view - Add a new rank which will redirect you to another page where you will be able to configure the new rank you are about to add. The configuration of a new rank is fairly simple and you will need to only input the Rank Title and the Minimum Posts which a user will get that rank based on. Once you are ready with that configuration hit the Submit button in order to save the new rank and you will be able to notice the new rank appearing in the table view of the Manage Ranks home page. In order to delete already existing rank you will need to use the red icon on the Action column next to the rank you would like deleted. Once you click you will need to confirm the deletion and the rank will be permanently removed. Last but not least you are probably wondering how you should edit an existing rank. It is fairly easy using the green icon in the Action column next to the rank you would like to edit. This icon will redirect you to the same page as the one you have seen when you were creating the rank, however this time the settings of the rank will be configured in order for you to edit these. Once you are ready with the edits please use the Submit button to save those. That is all! You now know how to fully manage the ranks on your Board!